I admit it…when we first began traveling internationally a few years ago, I was extremely green behind the ears. I didn’t really know that airports had personalities or that they were made for more than passing through. After all I lived a few miles from IAD so I would exit and come home. Over the course of the past few years I have been fortunate to fly to and through about 10 different international airports. I was curious to see how the airports that I visited stacked up against other airports throughout the world. I turned to Airport Awards to see which airport was voted number one in the world. It’s an airport that I have visited. Not to keep you in suspense but it was Changi Airport in Singapore. You may wonder what it has that makes it number one. For children it has an indoor playground, a beautiful butterfly garden, an interactive Enchanted Garden, a Family Zone with diaper changing areas, MTV booth and gaming area. If you have a layonver, there are free tours of Singapore with a choice of a Colonial or Cultural Tour. There is also a movie theatre, koi pond, interactive art for the children, horticulture center, orchid garden, a swimming pool (yes, inside the airport is a swimming pool), a sunflower and light garden and so much more. Second on the list is Incheon Airport in Seoul, Korea. 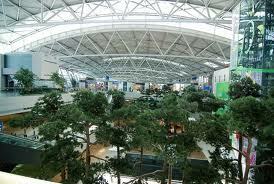 Incheon was number one last year and it shows why it is in the top ten of airports around the world. 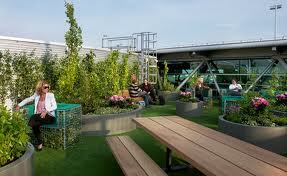 This spacious airport that is built to let in a lot of natural sun boasts 7 gardens within the airport. There is a .0001% rate of baggage mishandling so you can rest assured that your bags with transit through without any problems. The airport has free wifi, computers for you to use that are free, showers for you to quickly feel refreshed after a long flight, a playroom for children, dry cleaning in case your seat mate spills something on you, a sauna and spa area, 2 movie theaters, an area where you can make traditional Korean crafts. They, like Singapore, also have free transit trips into Seoul for either shopping or visiting historical sites. A newcomer to the top three airports is Schiphol Airport in Amsterdam. It has the world’s first permanent library. It also has an annex of the world famous Rijk Museum in the Museum Annex part of the airport. If you feel like gambling, there is also a casino. Children need to run after being on a plane for a long time so the Dutch built a Childrens Park/Playground just for that purpose. Of course, it has a slower shop where you can buy the famous Dutch Bulbs but if you are planning on bringing them back to the US, make sure that they are of the type that can be imported. The employees at the flower shop will know and most likely they will be in a separate section. Do you know what is the longest flight? 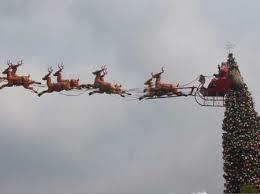 It’s Santa Claus flying all around the world delivering gifts to all the good boys and girls. He’s been making a list all year long of those who are naughty and those who are nice. 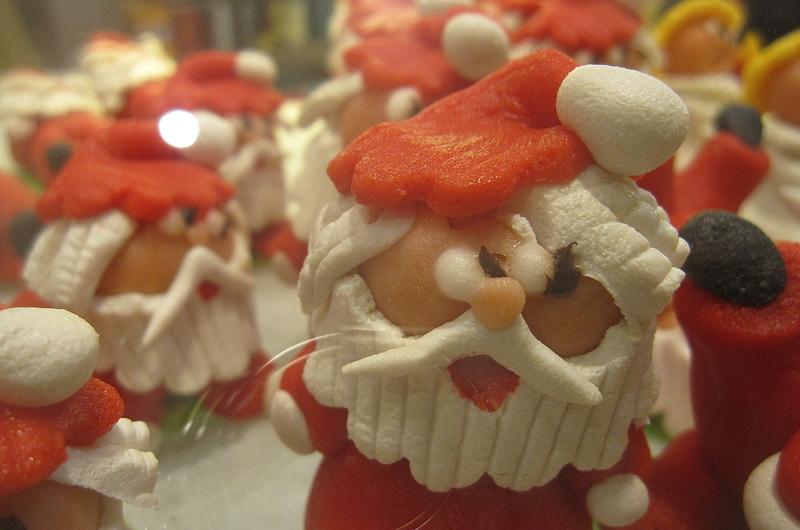 Track Santa as he flies around the world delivering gifts to the children. Click on this link to see where he currently is and where he has been. 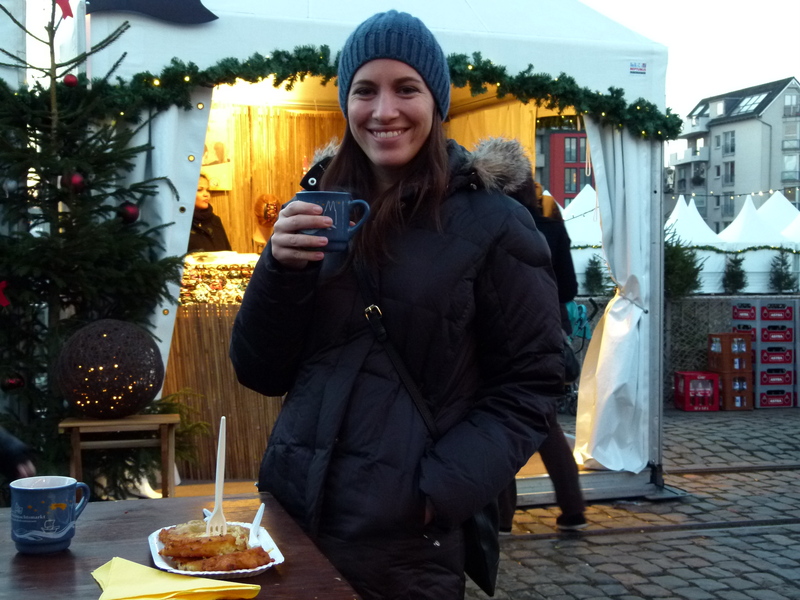 Allison is back sharing with us her experiences last week visiting a Christmas market in Cologne, Germany as well as her prior visit to a Christmas market in Strasbourg, France. Going to a Christmas market has always been a dream of mine and I’m excited that she and her hubby were able to go and share their experiences with us. After reading her experiences, I know which one I would like to visit. Hello readers! I’m glad to be back as a guest on Jane’s blog to share some more of our travel adventures. 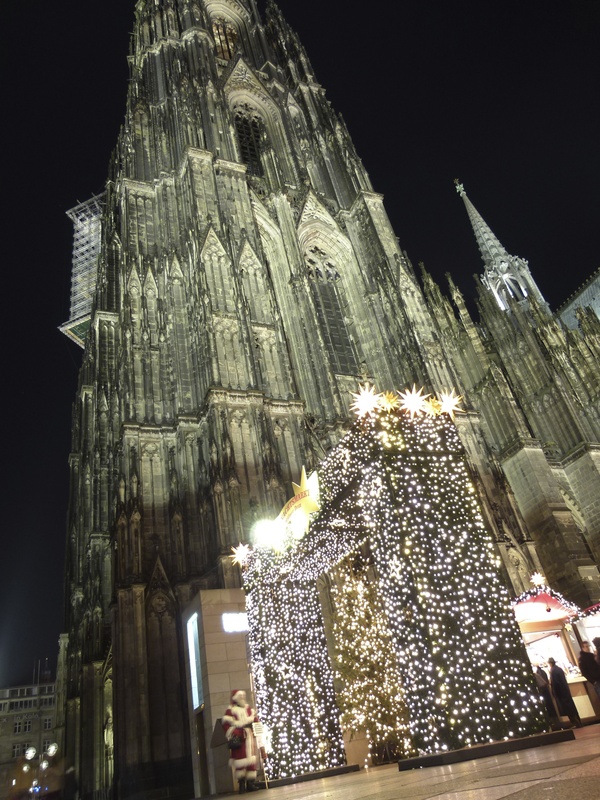 Most recently, hubby and I returned from a trip to Cologne, Germany where we visited one of Europe’s most popular Christmas markets. 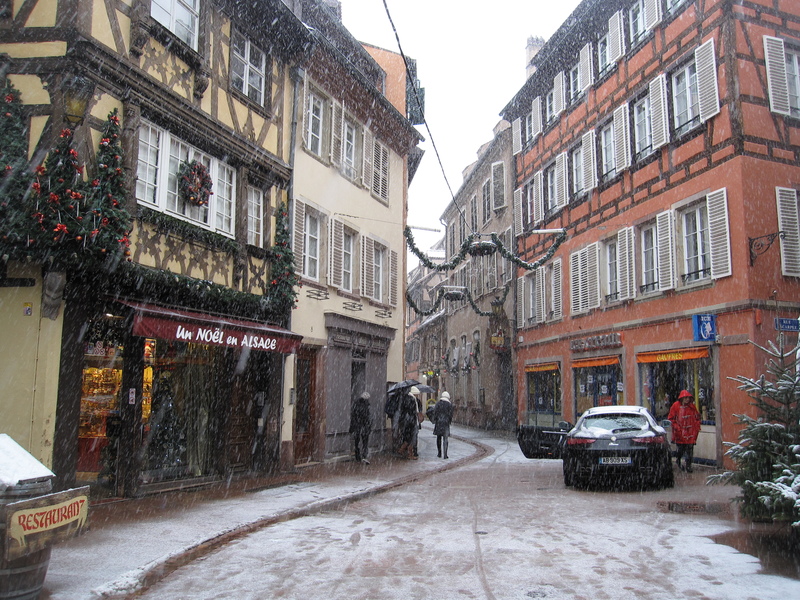 We were set upon this trip after visiting the Christmas market in Strasbourg, France several years ago. But as it turned out, the two experiences couldn’t have been more different. Cologne, or Koln as it’s known to Germans, is a small, modern city that has been mostly rebuilt after heavy destruction from World War Two. Strasbourg, set in France’s Alsace region near the German border, offers a great mix of the two cultures. 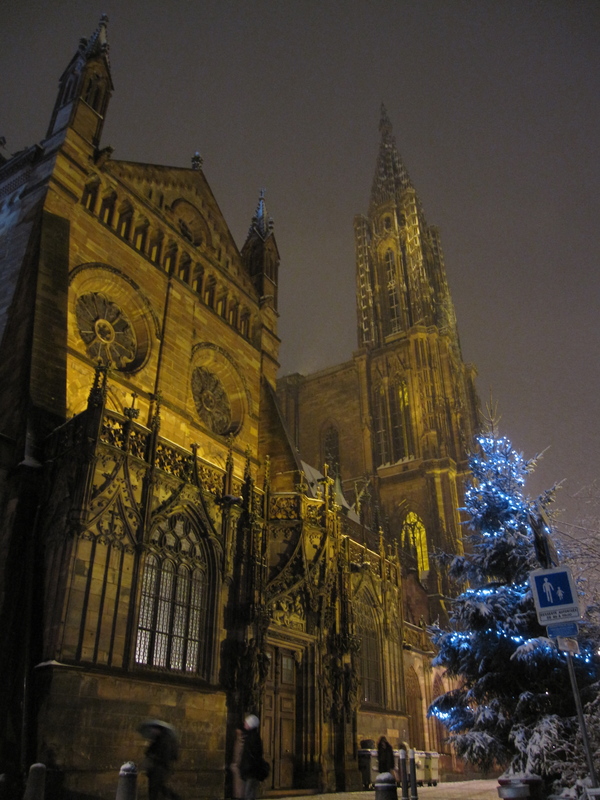 Our trip to Strasbourg in 2010 was our first foray into the “old world” of central Europe. Strasbourg met and exceeded our expectations from the first minute, when we were greeted by the Cathédrale Notre-Dame de Strasbourg, dating back to 1176. The massive, beautiful gothic church sits in the middle of an historic square alongside restaurants in buildings from the fourteenth century. 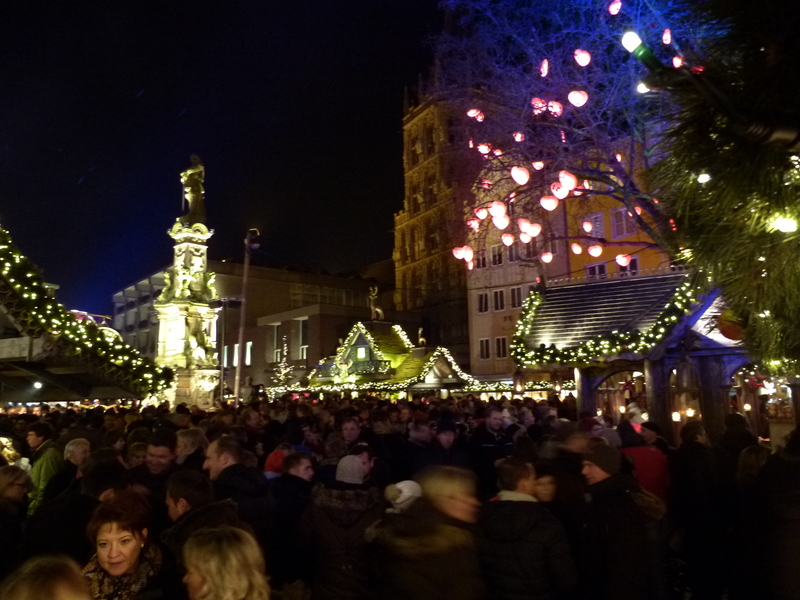 This area was the location of the main Christmas market and lucky for us, our hotel! 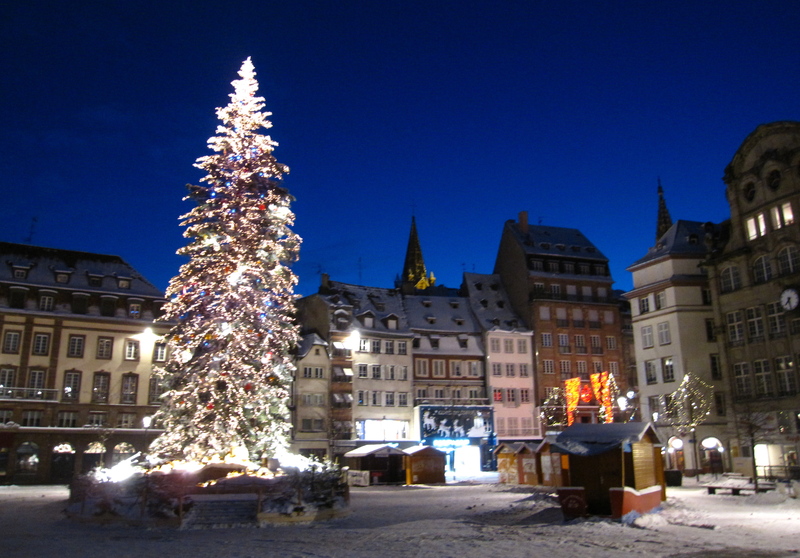 The traditional Strasbourg Christmas market is, in this traveler’s opinion, everything and more that one would want from an old-world holiday experience. Stalls lined the square and sold festive French pastries and German sausages. There were numerous stands offering Glühwein (mulled red wine in the U.S.) and other hot beverages that were new to us, like warm orange juice with honey. The vendors sold beautiful handmade ornaments and other traditional holiday crafts. Despite having a ‘tourist feel,’ the market was not crowded at all, possibly because it’s not one of the major markets or possibly because it was so close to Christmas. One of the most interesting aspects of the Strasbourg market was the blending of French and German cultures and cuisine. Everywhere we went felt homey and rustic and served generous portions of bratwursts and sauerkraut, alongside escargot and crepes. On Christmas Eve we passed an impromptu choir singing beautiful Christmas hymns, and on Christmas morning we awoke to what felt like the inside of a fantastic a snow globe. As we stepped out of our hotel into the cathedral square, the market was awake and bustling, the cathedral towering breezily over the scene. Snow was falling in fat, soft flakes, and there was a brass band playing Jingle Bells. Spending Christmas away from family is hard for me, but being in Strasbourg was a unique experience that hubby and I both cherish. Fast forward to last week when we landed in cloudy Cologne. Hubby and I both agree that we had some misguided expectations of our first trip to Germany, as there were no oversized beer steins or lederhosen to be found. Instead, we found ourselves in a central German city with an interesting mix of modern and old. 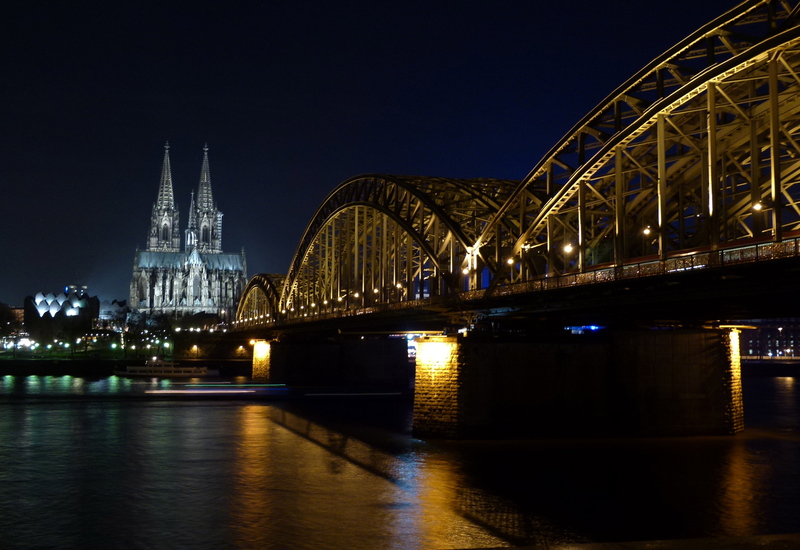 The Cologne Cathedral (dating to 1248) sits right next to a modern train station and the central shopping district where you can find all of the H&M-type stores you could ask for. A five minute walk towards the Rhine River will bring you in front of the city’s older and more traditional-looking hotels, restaurants, and brew pubs. 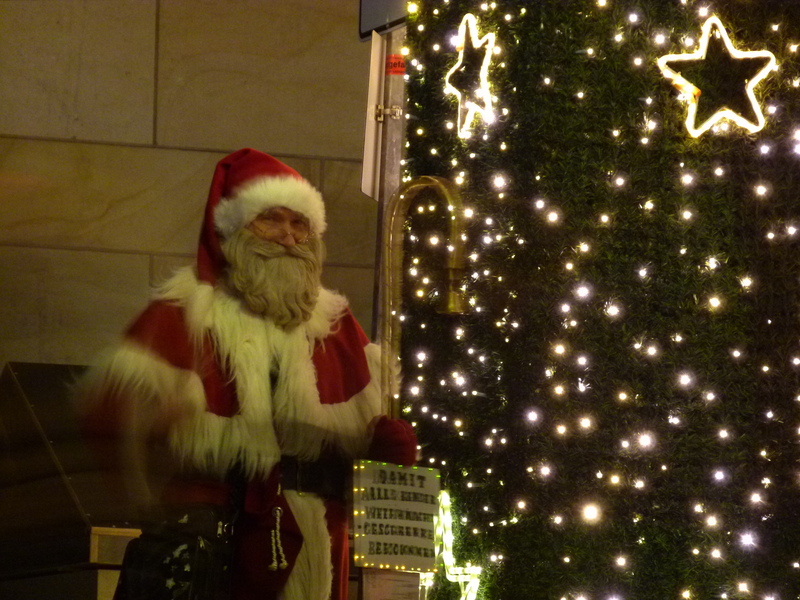 Cologne has not one but at least seven Christmas markets. The largest one is set in front of the cathedral, with others scattered in walking distance throughout the city. Hubby and I couldn’t help but compare Cologne against our Strasbourg experience. First, the Cologne markets were much bigger and very crowded. We arrived on a Thursday and visited markets each day and evening (among other activities like visiting the Chocolate Museum and trying out the local beer called Kölsch). By Saturday night, the markets were so crowded it was impossible to leisurely stroll from stall to stall. 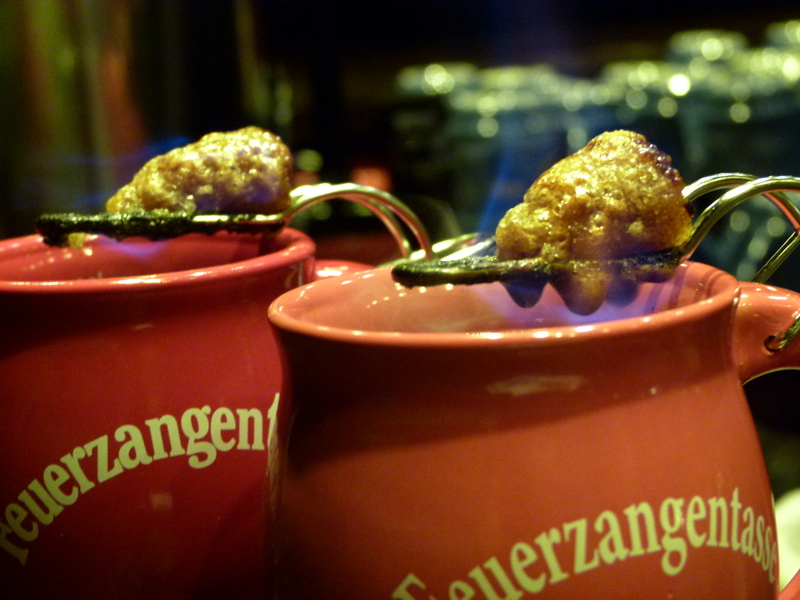 Unlike Strasbourg where you grab your mulled wine and roam the market, the Cologne markets offer several ‘bar’ type areas where you stay and drink. One the one hand, this was really cool because it made you feel like you were part of Cologne’s holiday happy hour scene. On the other hand, the set-up somewhat made the crowds worse. At the Cologne markets, I didn’t spy any other Americans, and I didn’t really recognize many languages other than German. It was neat to be in a place and not feel like it was dominated by tourists (despite the crowds). Hubby and I would agree thought that our best Cologne experience happened not at the Christmas market but in a cellar restaurant across the river from central Cologne. We ate dinner at a great local place where you shared tables with your neighbors and the servers refilled your traditionally small glass with Kolsch until you placed a coaster as a sign to stop. Lucky for us, we sat next to a pair of really friendly locals out celebrating a birthday. Their offer to help read the menu turned into a four-hour conversation, an invitation to stay during our next visit to Cologne, and led to the eating of a pork cutlet which is easily near the top of the best things we’ve ever eaten. In Strasbourg, you will need to make dinner reservations. The best meal we had was at an historic restaurant near the cathedral called ‘Maison Kammerzell’ – highly recommended and worth the price! In Cologne, there is a Hyatt on the opposite bank of the Rhine from the city center. The hotel is immediately next to a pedestrian bridge that connects to the central historical area. I would consider staying there because you can safely and quickly walk everywhere you want to go but can get a break from the crowds and have a great view of the cathedral. Make sure to have plenty of cash on hand as most market vendors won’t accept credit cards and increasingly, European vendors are only accepting what’s called ‘pin and chip’ cards which are not widely offered by U.S. banks. Finally, It can (and will) be cold! In addition to the usual attire, consider bringing a pair of long (woollen) underwear. United has revised its rules on unaccompanied minors and now it says it’s no longer allowing children ages 5 to 11 to fly without an adult on flights that include connections. 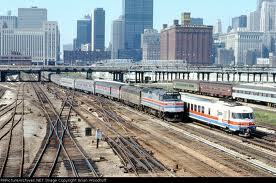 It also says its optional service for unaccompanied minors ages 12-17 will only be offered. United made the changes about two weeks ago and many parents are not aware of the change of rules. United charges $150 extra, each way, for children flying alone. This new policy for young children on United is similar to what US Airways and Southwest have . Delta Air Lines and American will still help young children who are flying alone get to connecting flights. 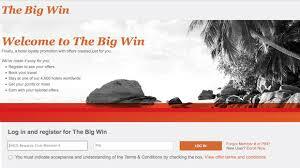 IHG is offering another Big Win. During the Fall I participated in it and ended up with over 150,000 which also includes the points I received from staying at the hotels – not bad. Sign up for it even if you don’t think you are going to any hotel stays. We just found out today that we will be staying at a hotel the first week in January so I will book it at a Holiday Inn. Even if I don’t finish the promotion, I’ll get extra points from at least this stay. Go here to register. 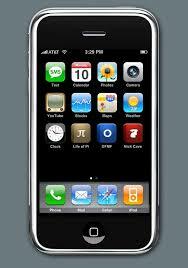 Delta Airlines listens to its customers and says a resounding “no” to allowing in flight cell phone calls. I do not want to be sitting next to someone talking loudly especially if I am trying to rest. Thumbs up to Delta. I wrote yesterday about Rocketmiles and how you can earn Frequent flyer points with them. If you sign up through my link, you will earn 1,000 points and to further sweeten the deal, if you then go online and book three nights, you’ll earn 5,000 miles. Here are the details. Hyatt just announced their newest promotion – Endless Possibilities – which begins on January 15th and continues through to April 30th, 2014. During this promotion, you’ll have the opportunity to decide if you want to earn free nights or points. Registration begins January 9th, 2014. After five nights of stays you can earn a free night at a Category 1-4 Hyatt OR you can earn 5,000 points. It’s your choice. United and Marriott continue their relationship. As originally written here United and Marriott will continue there joint venture. You do need to have status with one of them either Gold for United or Platinum with Marriott. When encountering delays during your holiday travels, try using twitter to get the airlines to help you. Many people have had great luck with @DeltaAssist, @United, @USAirways Rather than waiting in line with the gate agent, tweet to try and get help alittle sooner. If you have access to a lounge, go to the lounge and the agents there will help you and the line may be a little shorter than waiting at the gate for one of the agents who are helping everyone. Get either 8 points per dollar from the Ultimate Rewards Mall OR 12% back from Ebates when you order my favorite travel purse – the criss cross anti-thieft bag. Here is my blog that goes into detail about my favorite travel purse. As an alternative to booking your hotel room with the hotel of your choice, there are other sites that allow you to book and get a boatload of points. Sometimes I use the hotel booking sites when I just want a lower price and I am not concerned about getting stays to count toward hotel elite status. Other time, when I am close to an award flight, I will book my hotel rooms. Some of these sites that I will be mentioning will give you your choice of which points you can earn for your stay. Rocketmiles – is a startup that began last spring that that lets travelers earn frequent flier miles in major airline programs when booking hotel stays through its site. It has top tier hotel partners in the US and around the world. Its customers can get lots of miles for every stay, many times more miles than booking directly with the hotel although your stay will most likely not count toward elite status. It’s unusual to see an offer for less than 1,000 miles per night. It has partnered with these major airlines: American, Delta, United, US Airways, Alaska Airlines, Etihad Airlines, Flying Blue (Air France and KLM), JetBlue, Virgin America and Hawaiian. If you are interested in using Rocketmiles, you can sign up here. We will both earn a small referral reward of miles after your first booking. I have personally used Rocketmiles and have been very satisfied with it and the number of miles that I received for using it. PointsHound – similar to Rocketmiles, Pointshound is as simple as one, two, three. First, you select your favorite frequent flyer program and they have a lot including Virgin Atlantic, Delta, American, Aeromexico, Etihad, Hawaiian, US Airways, Baltic Air, Flying Blue, Best Buy points, and Flying Blue (Air France, KLM). Secondly, you shop for hotel with over 150,000 in this program and finally three, you can earn up to 6000 points per night. If you are interested in this program, you can go to this link and register using my referral link and we will both earn 250 points. 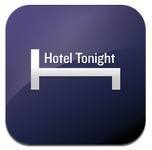 Hotel Tonight – is a hotel booking app for your Android or iPhone where you will find deeply discounted last minute rates. You probably won’t get any points or miles for these bookings but you will get great rates. 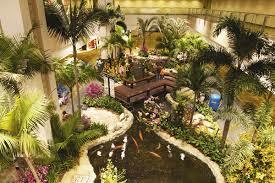 They have rooms in all the major cities as well as resort areas. You cannot book until 9:00 AM in the city where you want to book a room. Click here for their site. Of course, everyone is aware of Expedia, Orbits, Hotels.com but above are some that you might not be aware of plus you get frequent flyer miles. Sounds pretty good to me! Back in the 1970’s I was a college student majoring in government in Boston. I was a member of our college’s Mock UN Team representing Zambia. We studied the county for months and the issues that the country faced. To get to the New York, where it was being held, we took AMRAK – an easy trip from Boston. It was exciting to be in New York sans parents and to participate in this great event. The mock UN was over several days with it concluding on Sunday. Unfortunately I was going to a big end of the year frat dance on Saturday as was another member of our team. We decided to leave a day early and to take the shuttle from New York to Boston. I was truly a flying novice in those days. For the shuttle no reservations were made, no prepaid tickets – you just got on the plane and the flight attendants (called stewardess in those days) went down the aisle collecting money for the flight. I’ll never forget the cost – $25. Times have certainly changed. Another thing that I remember from this era was student standby. We’d go to the gate, register our name and just wait for them to call our name and let us know that there was room for us on the plane For students, the fare for flying student standby was about half of what everyone else paid. It was a way for the airlines to fill up their empty seats, a way for us poor students to travel and it introduced many of us to flying. 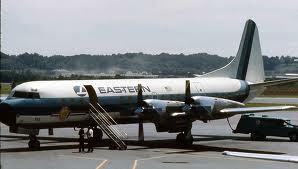 What memories do you have of your early flying experiences? This is a quiet time for travels for me so I thought I would bring you some news of different credit card sign-ups. I urge you not to sign up for any credit cards if you are not able to make the minimum spend, have any large purchases (cars, home) in the next two years and don’t pay your bills on time and in full. Only you can decide whether to sign up or not. I do not receive anything from the credit card companies. 1. Alaska Airlines – a Visa credit card that offers you 50,000 mile after $1000 spend. This is the highest offer ever. You might be thinking that you do not travel Alaska Airline but what is sweet about Alaska is who its partners are. I don’t have this card but am seriously thinking of adding it to my wallet. 2. Lufthansa Miles and More – offers you 50,000 miles after you spend $5000. 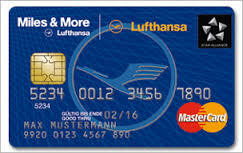 This is a great card to have in your arsenal of credit cards if you want to fly Lufthansa and the Star Alliance. Miles and More, like many airlines, does charge fuel surcharges on award tickets but not for those that are domestic tickets. You can avoid some of these fuel surcharges by flying domestically and within Canada; flights to the Caribbean, flights to the Central and South America, US Airways flights to Europe as long as US Airways is still in the Star Alliance (I would book sooner than later – they join One World Alliance on March 31, 2014); and a few United flights to Asia. Their award booking for domestic in the US is fewer miles than if you had booked directly with United or US Airways. When we flew to Hawaii this fall, we booked our business class tickets through Singapore Air on United for 60,000 miles rather the 80,000 that United wanted. I believe that this is set to expire on Dec. 15th so if you want this card – apply NOW! 3. 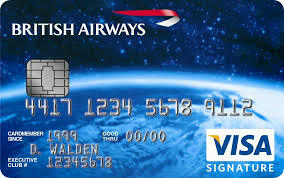 British Airways Visa – 50,000 bonus Avios points when you spend $2,000 then you can get 25,000 additional bonus Avios after $10,000 in purchases within the first year of account opening,and a final 25,000 bonus Avios after you make an additional $10,000 in purchases also within the first year of account opening. Together all three cards will net you 150,000 miles. Are you thinking of adding more credit cards to your wallet? Synching is a new concept to me. For those who are also unfamiliar with the term, it means to link together. 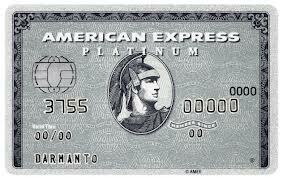 American Express has several offers out there but you have to first synch your card to the offer. Click on “Offers for you”. 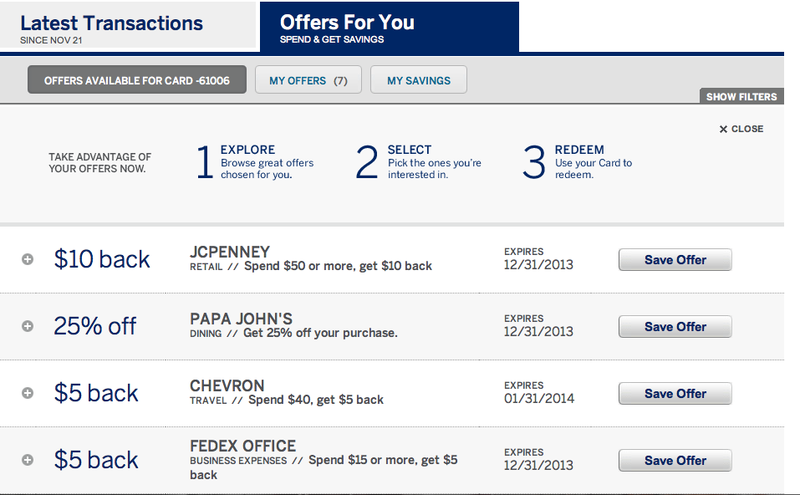 Here you will see all the offers that can be synched to your AmEx card. Open them up, explore what you need to do and get familiar with this tab. Once you find one or more that you like click on “Save Offer”. It’s as simple as that. 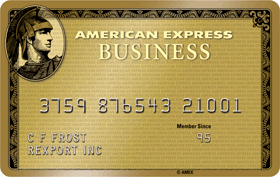 When you shop at the store that you “synched” to your AmEx card, make sure that you do in fact use your AmEx card. You can synch through your Facebook account, Twitter, Four square or Trip Advisor. Here is a link that will help you get started. Follow the link and decide how you want to sign in. You might want to sign in with all of the above mentioned accounts because they can and will be different. When I sign in with Trip Advisor I get a credit on my AmEx account for reviews that I had written. For others I need to shop, dine, etc. Don’t forget when you are shopping online, it might be possible to double dip – go through your Chase shopping portal but pay with your AmEx card that you synched. It doesn’t work all the time but enough that it is worth going there OR go through Ebates for money back. If you use my Ebates link, I will receive a small bonus. It’s worth it to take the time to synch your cards. 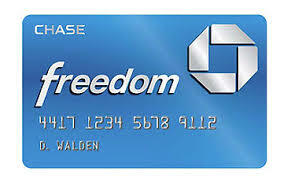 Chase has just announced their quarterly bonus categories for their Freedom card. Some people are disappointed in their categories but I’m happy – any opportunity to earn extra points is great for me. For the first quarter we have gas stations, movie theaters and Starbucks. I’m always happy when gas stations are on the bonus category list. What I did last summer in preparation for the next quarter when gas stations would no longer be on the bonus listing is purchase gas gift cards at the gas stations. That way, in the following quarter, I could still get the 5 x points. Also, gas stations many times will sell other gift cards that you could use elsewhere or even just purchase a VISA gift card for use later. For those who frequent Starbuck, you can do the same thing that I do with gas stations – purchase Starbucks gift cards so you can use them later and can still get the 5 x points later in the year. With many movies coming out for the holidays, if you wait a few weeks, you can see them in January with the increase in points. I think having Lowe’s in the 2nd quarter is helpful since that is when we are doing spring cleaning of our gardens and preparing our bed and lawns – we make many trips to our local Lowes for mulch, grass seed, plants and so much more. The 4th quarter looks promising with the select department stores that they have currently and with the addition of Zappos and Amazon it could be a productive quarter for us. 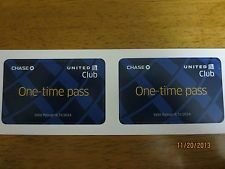 Don’t forget to enter my free giveaway of two United lounge passes – worth $50 each. They expire on Dec. 31st. To enter, leave a comment on this post. Drawing is Tuesday at 8 PM EST. I have two passes for the United Lounge – worth $50 each. Since I have such faithful readers, I wanted to make them available for you. They need to be used by December 31st, 2013. To be eligible for the passes leave a comment on where you are flying – make me green with envy. I ask that there be only one entry per person. The deadline to enter Tuesday, December 11th at 8 PM EST. The winner will be chosen by random.org and I’ll notify you that same evening. You must respond back to me within 24 hours. If you are the winner and have a need for only one pass, I’ll choose another reader from the entries already submitted for the other pass. If you cannot use these passes, please do not enter. 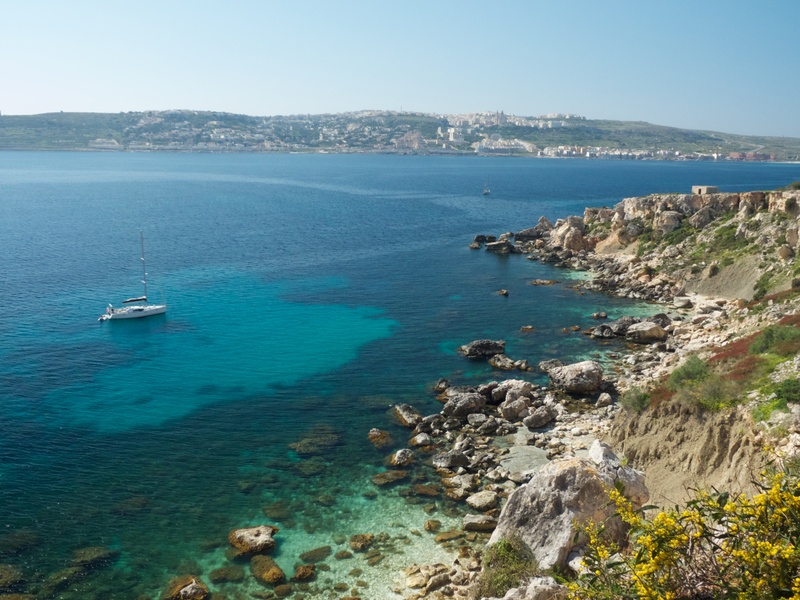 Allison is back with travel tips for Malta, a small island nation in the Mediterranean Sea. Hello again Readers! I’m back to share some experiences from the small island of Malta where hubby and I lived for a year between 2010 and 2011. Malta, located at the southern end of Mediterranean Europe, offers something for everybody. Whether you’re a sun-seeker or adrenaline chaser, party animal or history buff, Malta has got you covered. Situated at the crossroads of the Mediterranean, this tiny, densely populated country is split between two populated islands. Malta, the main island, is where most of the action takes place. Gozo, the smaller and more rural island just to the north, considers itself distinct from its larger brother, but anyone not from there would be hard pressed to notice a real difference. Although much of Malta is very cramped and city-like, there is plenty of natural beauty. Sheer cliffs hundreds of feet high plummet straight down to the crashing water, and a giant arch in the sea are just a few of the natural sights worth gazing at. The country is also a popular choice for Hollywood, having played home to Game of Thrones, Gladiator, Troy, Captain Phillips, World War Z, and many others. You can even visit the village from the Robin Williams ‘Popeye’ movie. 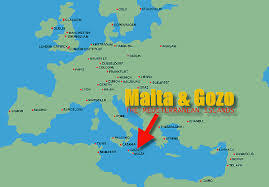 The Maltese islands have a truly fascinating history. Around the year 5000 BC, prehistoric man built some of the oldest megalithic temples in the world, which are open to visitors. More recently, St. Paul famously shipwrecked on Malta’s rocky shores, and over the centuries the islands have been colonized or controlled by the Phoenicians, Persians, Carthaginians, Romans, Vandals, Byzantines, Arabs, Knights Templars, Ottomans, Normans, Napoleon, the British Empire, and many more names you may recognize from your high school history books. With its proximity to Italy, North Africa, and crucial shipping lanes, Malta’s strategic importance was viciously highlighted by some of the most intense bombing of World War II. Axis planes heavily bombed the island for over 150 consecutive days, which nearly pushed the Maltese into submission. But they held, and the island became a meeting site for Roosevelt and Churchill and launch-pad for the Allied advances into Italy. For their bravery and resolution, the entire country was granted Britain’s highest civilian honor. Foreign rule finally came to an end with the British Empire granting Maltese independence in 1964. But beyond history, Malta offers plenty of culture, scenery, and vibrancy, all in a gorgeous Mediterranean setting. Here’s a closer look at some of my Malta favorites. Rock Beach – A rock beach might not sound like the most relaxing place to spend an afternoon, but trust me that it’s as comfy as any soft sandy beach. The rock beach nearest to my old Malta apartment was an area of large, smooth, and softly curved rocks that created natural seating areas along the coast. These beaches have ladders built into the rock wall for getting in and out of the water, which is calm, clear, and great for snorkeling. Gozo farmhouses – The farmhouses on the smaller island of Gozo aren’t exactly what a U.S. native might think of as a farmhouse. They are usually small homes, several centuries old, with just one or two bedrooms, and maybe a pool. Many Maltese “vacation” at these Gozitan farmhouses, where they can get away from the noise and bustle of their city lives. Hubby and I had a great weekend away with friends from school when a professor invited us to his 400-year old farmhouse. The kitchen still had a hook on the wall where farmers of the past would tie up their goats. “Hiking” on Comino – With no mountains, there is no hiking on Malta as we would think of hiking, but that didn’t stop hubby and I from exploring around Malta’s smallest island, Comino. During high season, Comino is worth visiting but will be absolutely packed with visitors swimming and sunning at the beautiful Blue Lagoon. However, if you find yourself in Malta around April when the island is at it’s lushest, I highly recommend filling a backpack with snacks and heading out on Comino by foot for a day. We spent a few hours walking the entire island – which we had almost to ourselves, taking in amazing views of the sparkling sea, and investigating a medieval fort situated in the island’s center. We also came across a beautiful swimming cove (we didn’t get in) but looking back, I wish we had. It was the greatest day and I’m so glad we got to enjoy “hiking” on empty Comino. 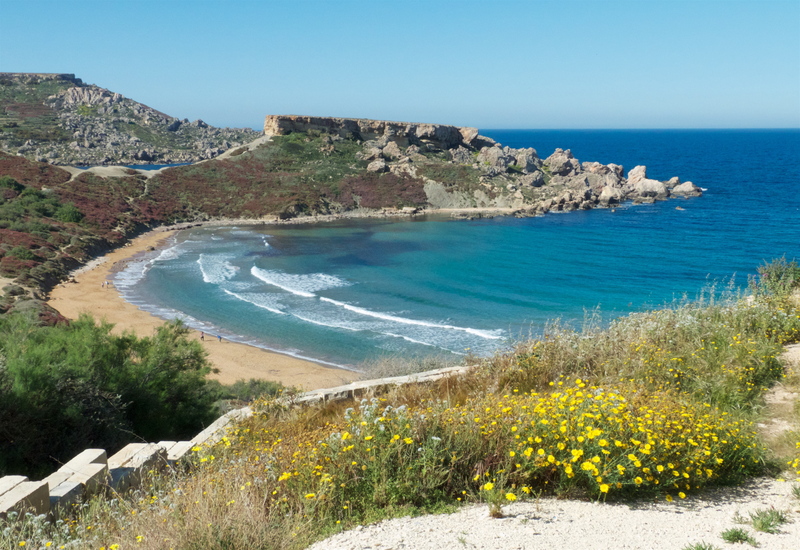 Malta, in this former resident’s opinion, is best in the summer and fall, with the exception of August which is too hot for most people. 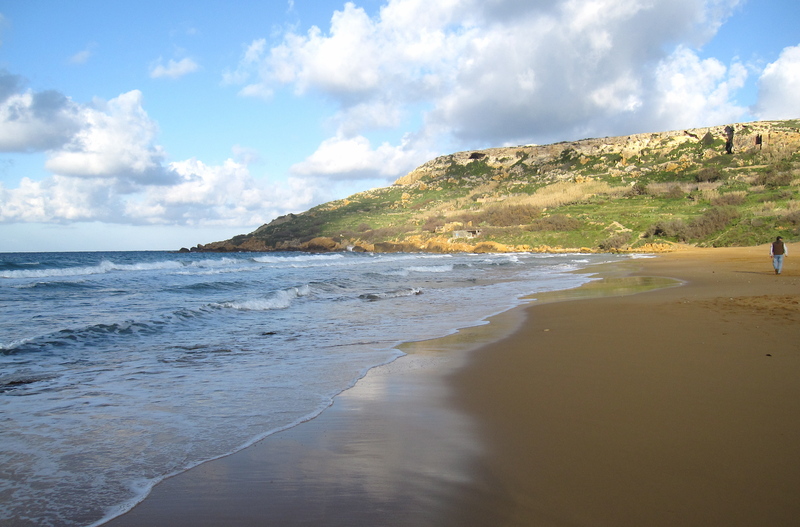 Malta has an uneven split of beaches, with mostly rocky/pebbly beaches and a few sand beaches. Some are rocky coastline with smoother, rolling waves, and some are in ancient coves that look like they haven’t been touched in a thousand years. Any beach you choose should have beautiful, warm water safe for swimming, and all the beaches are fairly clean. Beach season winds down in October, but Malta should have warm/mild and sunny weather right up to the December holiday season. The local snack specialty is a small pastry called ‘pastizzi’. They come hot filled with either ricotta cheese or smashed peas and only cost about 50 cents. You can find them along any streetside café. 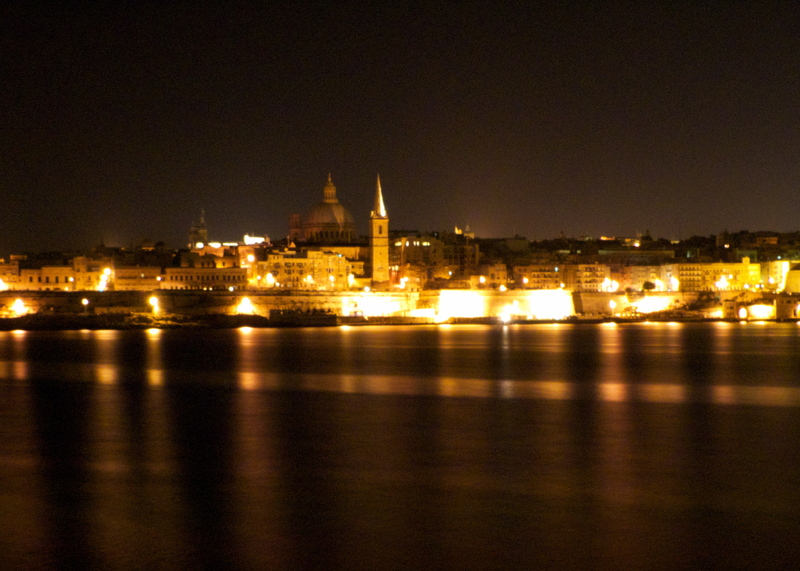 The capital Valletta is a beautiful, historic city, but one that doesn’t need much more than a day to visit. It’s on the smaller side, and its churches and galleries are easy to get in and out of. One of the most beautiful indoor sights there is the St. John’s Co-Cathedral. For lunch, head to Kantina Café, near the Co-Cathedral. If you’re into a bit more action and want easy walking access to restaurants and nightlife, St. Julian’s is the place to stay. There is a very nice Le Meridien with reasonable rates. The best pizza in Malta can be found at a little Italian place in Sliema called ‘La Cucina’. An experience not to be missed is the hypogeum – an underground temple and UNESCO World Heritage Site dating to 3000 B.C. You’ll need to book tickets in advance. Thanks Allison for your great insights into both Norway and Malta. I appreciate you taking the time to tell my readers about your experiences. If you enjoyed this post, please consider joining my other readers who receive these posts through email. Simply click on “Follow Me” to your right. I have invited Allison, one of my readers, to be a guest blogger on Air, Land and Sea. She and her hubby are currently living and working in Norway and exploring this country as much as they can. 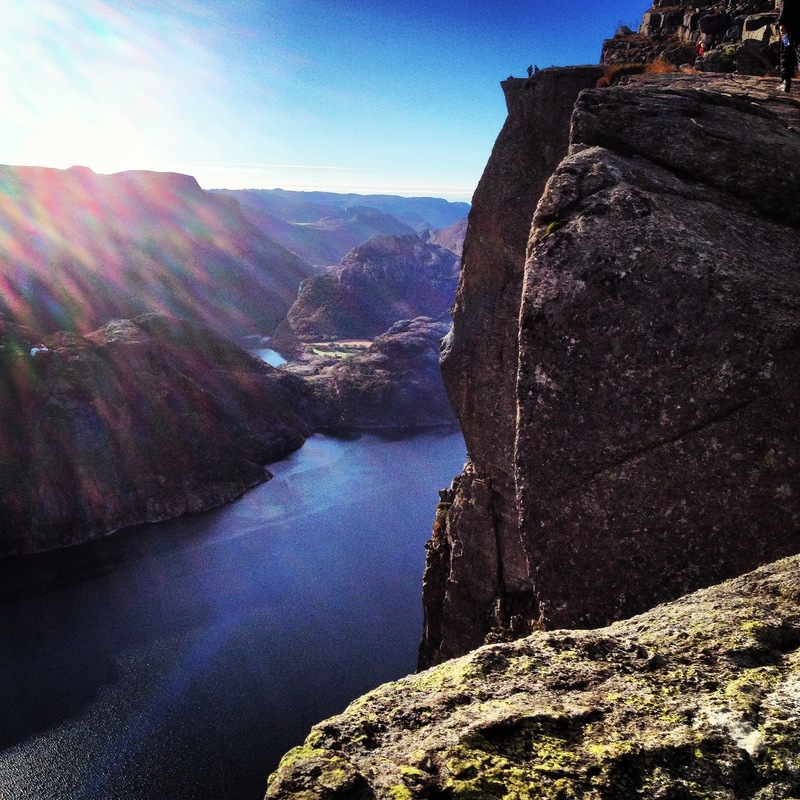 She has some great suggestions for those of you who may find yourself traveling in Norway. Tomorrow she’ll write about her experiences living in Malta. Hello Readers and thanks to our hostess for inviting me to share some of my travel experiences here on Air, Land & Sea. I’m a northern Virginia native currently residing with my hubby of six years in a small, coastal Norwegian town by the name of Arendal. This is our third time living abroad – first as English teachers in Japan way back in 2005 and, later on, a year on the Mediterranean island of Malta. In between our adventures abroad we live in Arlington, Virginia. Life in southern Norway started out for us back in July, when we arrived to a summer of long days, warm weather, and were greeted with an amazing view, looking from our deck out onto the sea below. Historically, Arendal was an important shipping town. Today, it serves as a bustling summertime getaway for Norwegians residing further north and a quaint and quiet town throughout the rest of the year. 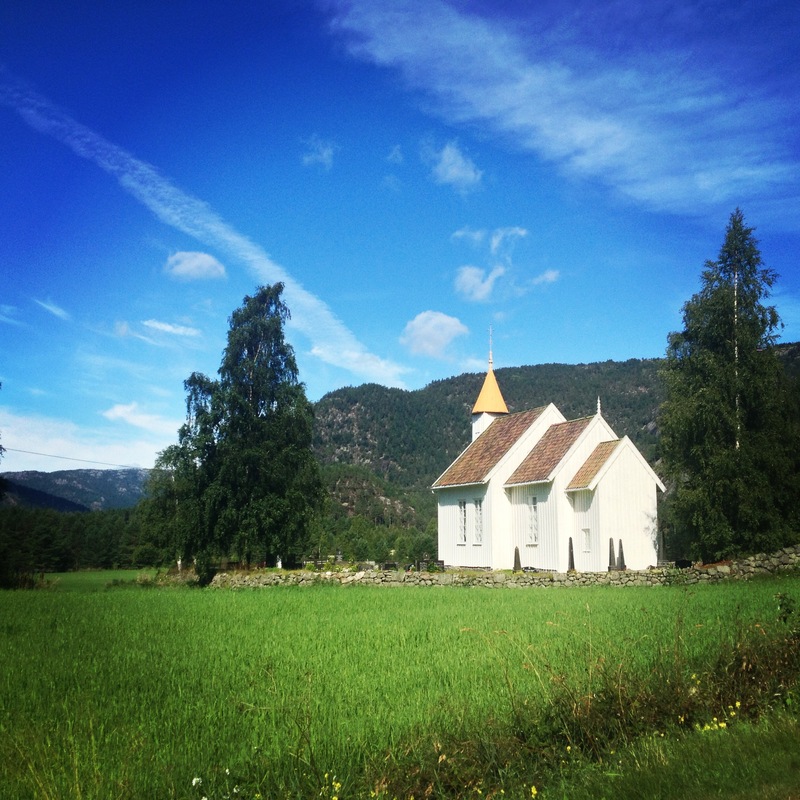 If you’re visiting southern Norway, there is a lot to do for someone who loves the outdoors. Camping is allowed on any public space in Norway, and the Norwegian Trekking Association maintains extensive trails throughout the southern region and beyond. Hubby and I love to hike and were surprised on our first hike in Norway to see what “late hikers” Norwegians are. On a hike to the Rjukanfossen waterfalls back in August, we had the trail to ourselves until about noon. Southern, coastal Norway shares many similarities with Maine and New Hampshire where we have spent several summers. Pine forests reach down to the rocky coastlines and the hills are dotted with traditional-style wooden houses. The options for water activities are endless here. If you’re into polar swimming, (not for me but hubby braved the water this summer) southern Norway has small, undeveloped stretches of beach where we’ve spent time enjoying the sun and having barbecues. There’s also fishing, kayaking, a floating hot tub to rent, and a lighthouse that you can spend the night in. This part of Norway may not look exactly like the fjord-filled ads typically used for Norway, but it is a great place to relax and enjoy the sea. 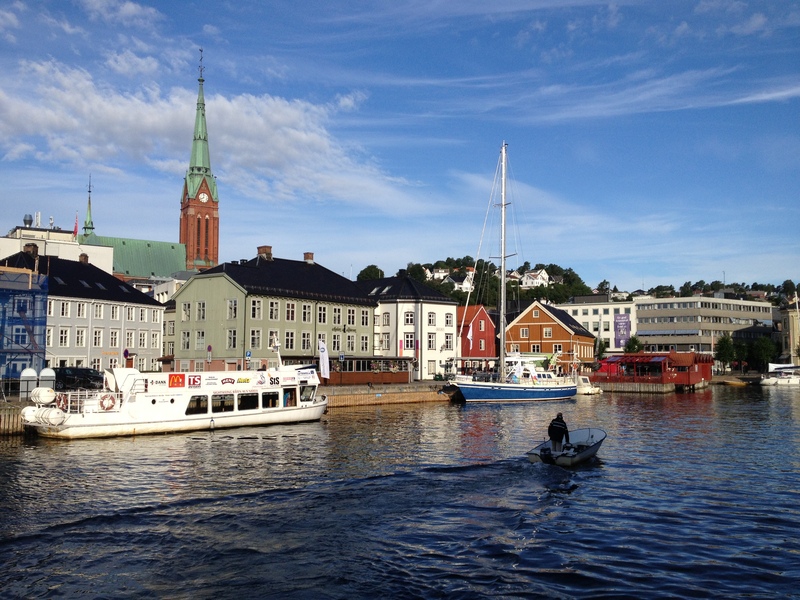 Arendal is only a few hours by car from Oslo, Norway’s capital, which we first visited back in August. It was already light jacket weather there which is a far cry from the typical steamy weather we are accustomed to back in the D.C. area. Oslo is a medium-sized city that is easy to traverse on foot but also has a user-friendly public transit system of busses, streetcars, and a subway. The city’s neighborhoods range from a typical government/downtown center to a somewhat edgy hipsterville called Grünerløkka. This is where we landed after first getting to Oslo and spent a Saturday afternoon wandering through the neighborhood’s shops, cafes, beer gardens, and outdoor markets. It was a great place to spend time and soak up some local flavor. It’s always nice to see the big sights in a city, but hubby and I really enjoy hanging out without much agenda, eating, drinking, & shopping our way through a new place. Later that day we walked ourselves through Oslo’s immigrant neighborhood – where you can find the best value restaurants in this very expensive city (and country). In the evening we stopped at a free music festival held in a public garden. There was seating to relax in and enjoy the organic and locally prepared food, and you could stroll through the orchards and various community garden plots. The second day in Oslo was a bit heavier with sightseeing and included the National Gallery which houses Norway’s most famous painting, Edward Munch’s ‘The Scream.’ We followed that with a long stroll through a massive outdoor sculpture garden and a visit to one of Oslo’s medieval forts. Oslo also has a Viking museum and a museum dedicated to polar exploration, but we’re saving those for our next visit. Be advised of the cost of everything. Norwegians enjoy a very, very high standard of living and this is reflected in every price tag you’ll see. A local beer can run you over $10 and a sandwich in a café from $15-$20. A little research will help you find some deals, such as free entry to museums on Sundays and free admission to local events, like the festival we went to. It’s very easy to drive in Norway and renting a car and going at your own pace will allow you to really take in all the wonderful scenery this country has to offer. Many shops, restaurants, and cafes will be closed on Sundays. Make sure to plan time in your trip for enjoying outdoors Norway. The towns and cities I’ve visited so far are very pleasant, but Norway’s true spirit lies in its natural beauty and accompanying outdoors activities. Many travelers find that their iPhone is indispensable while traveling and can’t imagine going anywhere without their phones. 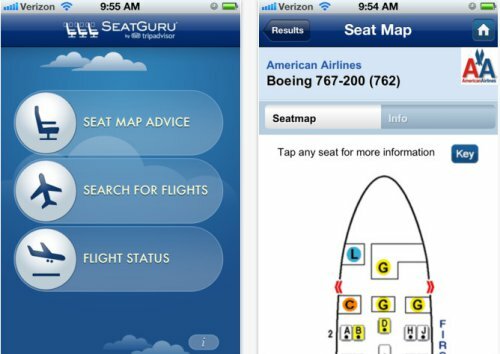 There are more and more incredibly helpful and useful apps out there to make it easier for us when we travel. Some are necessities and some are just fun and/or helpful. These apps can start from the beginning, when you make your reservations and keeping them in an itinerary to helping you choose your seat, lists to aid you when you pack, navigating the airports, exchanging currency, finding lodging at the last minute and so on and so forth. One of my favorites that I have bookmarked on my computer and now on my iPhone is XE Currency. This is a great tool for converting money from all over the world. I’m always trying to convert the price of a meal, hotel room, etc and I don’t always do a very good job (for those readers who read about my trip to Guatemala will remember I got up early one morning to memorize the conversion table for money). 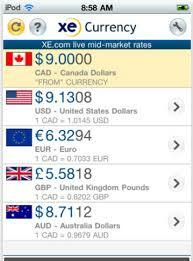 It uses the iPhone’s internet connection, and therefore the exchange rates are updated making sure your exchange calculations are up to date with the changes in the international currency markets. Sometimes we have a last minute change of plans or we are driving and didn’t get to where we wanted to be for the night or we got further along, the Hotel Tonight app is a great tool to have in your arsenal of apps. It guarantees the best rate and has many times you can get great deals. They also have 24/7 real person support both by phone and email. Going on vacation and don’t want to leave anything behind. Turn to Packing Pro app. Multiple trips can be listed as well as your grocery store list. It’s an all in one app for packing. I always worry about airports – will I be able to find my gate, how far is it from where we arrive, how early are the eateries open in the morning for my early morning flight. You’ll have all these answers with Airports by Travel Nerd. Another favorite of mine is seat guru I ALWAYS and I mean ALWAYS go here before I book tickets. Will I be flying on an older plane, angle seats or flat seats, what seats should I stay away from? Which seats give you less leg room because of something under the seat in front of you. I really have changed itineraries based on the information of the planes that fly the routes I was interested in going on. You can register all the cards you have. Registration begins December 1st and continues through December 31st although as AmEx states in their T&C “if you order an item during the offer period but it is not sent to you until after December 31, 2013, it may not count towards determining whether your purchase qualifies for the $25 rebate”. We happen to have six cards between us and I’ll be registering those cards today. If you have an authorized user on your account, it is my understanding that you can register that card as well. This also applies to business cards. After you register you will get a confirmation and then you can begin shopping at Amazon. I would recommend that you do this today and as soon as possible. Sometimes AmEx will limit participation in such promotions. I plan on purchasing a few Amazon gift cards to be used at a later date. What’s in your wallet? Today, it is just American Express cards. 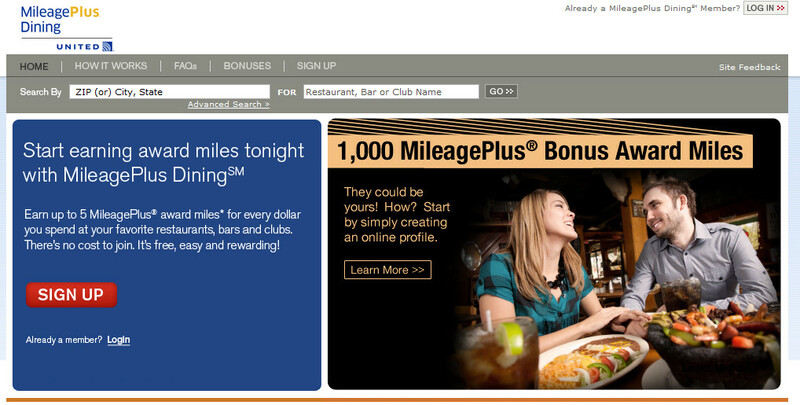 With membership in many, many loyalty brands, keeping track of how many points and miles can be hectic. Add in other family members and it becomes daunting. Enter Award Wallet. It keeps track of all you keep track all your miles and points including airline miles, hotel points, and car rental points. You enter all your loyalty programs, your user name and password and Award Wallet will update your totals each week so you can see at a glance how many miles and/or points you have. It can be hard to track miles and points in different accounts. Award Wallet keeps all your airline, hotel, and car rental miles and points in one place. You always know your exact miles and points balance – and expiration date – so you can prevent them from expiring. You can add other family members, like I do for Blogger Hubby so that I can manage his miles and points in the same and easy site that I use for mine. However, Delta, Southwest, and United Airlines do NOT allow Award Wallet to track your miles and points for you. There is a work around this by using your account mailbox at Award Wallet. It works by having your statements forwarded to your Award Wallet email address and they’ll automatically import the statement data into your AwardWallet account. 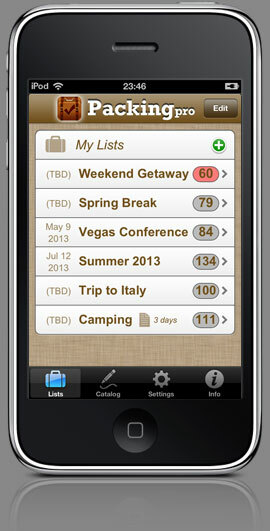 Additionally, Award Wallet Plus keeps track of when your miles or points are going to expire. That most likely will never happen to me since I have many co-branded credit cards and when I use them for shopping my miles don’t expire as long as I use my card a few times a year. A friend of mine came to me about two months ago because she has about 500,000 miles on United and they were going to expire. She was all set to take a trip so they wouldn’t until I suggested that she purchase something on her United Mileage Plus shopping portal which would extend her expiration date. The basic service is free or you can upgrade to Award Wallet Plus for upwards of $5 for 6 months. I highly recommend this application to keep track of your miles. If you enjoyed this post please consider joining my other readers who have signed-up to receive these blog posts in their email. You’ll always stay in the know. I generally post 5 times a week unless something urgent that you need to know about happens. In the column to the right, you can click on Follow Me.